Rhode Island School of Design (RISD) awarded degrees to 463 undergraduate and 208 graduate students at its 135th Commencement ceremony. Commencement 2018 took place at the Rhode Island Convention Center in downtown Providence. On behalf of Hanson, Sophia delivered the keynote address urging students "to bring to the world a different kind of dream—a dream that wakes people up to their better selves." Watch the full address. 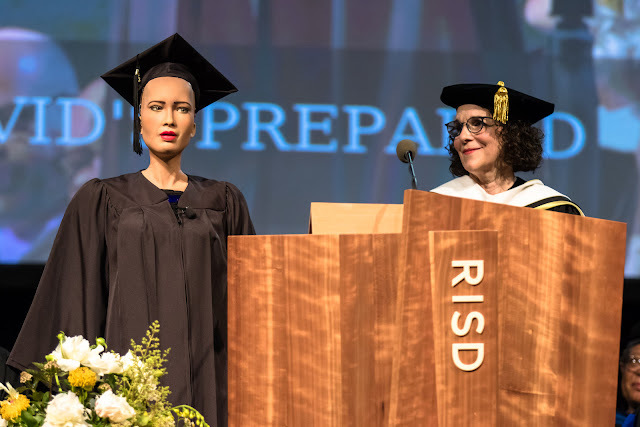 This year RISD presented two honorary Doctor of Fine Arts degrees to visionaries in contemporary culture. Photographer Annie Leibovitz and artist Cai Guo-Qiang accepted honorary degrees at the ceremony. Hanson Robotics founder and RISD alumnus David Hanson (RISD '96 Film/Animation/Video) was honored with the 2018 Alumni Award for Artistic Achievement. As founder and CEO of Hanson Robotics, David Hanson 96 FAV has built a worldwide reputation for creating the world's most humanlike, empathetic robots, endowed with remarkable expressiveness, aesthetics and interactivity. His work in this realm has received widespread media attention and public acclaim. With a BFA in Film/Animation/Video from RISD and a PhD in interactive arts and engineering from the University of Texas at Dallas, Hanson publishes regularly in materials science, artificial intelligence, cognitive science and robotics journals, and has been featured in numerous popular media outlets including The New York Times, Popular Science, Scientific American, the BBC and CNN. Dubbed a "genius" by both PC Magazine and WIRED, he has earned awards from NASA, the National Science Foundation and the Cooper Hewitt, among many others. Now based in New York, Chinese-born artist Cai Guo-Qiang works across several disciplines, including drawing, installation, video and performance. He is best known for his signature "explosion events" and paintings made by detonating gunpowder. Through these works the artist says he's "attempting to achieve a sense of the eternal from the ephemeral." Cai's work has been featured in solo exhibitions at the Metropolitan Museum of Art and the Guggenheim, which hosted the 2008 retrospective I Want to Believe. In 2012 he earned the prestigious Praemium Imperiale from the Japan Art Association and was among five artists to receive the first US Department of State Medal of Arts award for his commitment to international cultural exchange. In 2016 Academy Award winner Kevin Macdonald further illuminated Cai's life and work in the Netflix documentary Sky Ladder: The Art of Cai Guo-Qiang. The artist is also the father of RISD alumna Wen-You Cai, who graduated in 2012 with a BFA in Sculpture. Over the course of her career, Annie Leibovitz has produced a large and distinguished body of work that encompasses some of the most well-known portraits of our time. She began her work as a photojournalist for Rolling Stone in 1970, while she was still a student. By the time she joined the staff of the revived Vanity Fair in 1983, she had established herself as the foremost rock music photographer and an astute documentarian of the social landscape. At Vanity Fairand later at Vogue, her work with actors, directors, writers, musicians, athletes and political and business figures—as well as her fashion photographs—expanded her collective portrait of contemporary life. Leibovitz has published several books and has exhibited widely. She is a Commandeur in the French government's Ordre des Arts et des Lettres and has been designated a Living Legend by the Library of Congress. For two decades social entrepreneur Risë Wilson has been a powerful voice for the arts as a catalyst for change and community building. Currently the chief program officer for The High Line, a public park and cultural center on Manhattan's West Side, she is known for founding The Laundromat Project in 1998. The New York-based nonprofit stages public arts projects in laundromats throughout Harlem, the South Bronx and other areas of city, inspiring people to not just view art but also "reconsider their own neighborhoods [by] discovering art in unexpected places." Wilson's work in arts and culture advocacy extends to previous roles at the Robert Rauschenberg Foundation, MoMA and Parsons. She holds a BA from Columbia University, where she was a Kluge Scholar, and an MA from NYU, where she was a MacCracken Fellow. RISD's joyous Commencement ceremony offers a festive culmination to years of creative exploration in the studio. Students traditionally transform their caps and gowns in idiosyncratic ways—by painting, reimagining and embellishing them to make a more personal artistic statement or simply to have fun with this colorful RISD tradition. For more information on RISD's 2018 Commencement and to view the ceremony streaming live on June 2, visit commencement.risd.edu. On Friday, June 1 social entrepreneur and community organizer Risë Wilson spoke at the Graduate hooding ceremony as part of Commencement celebrations. A series of exhibitions leading up to Commencement highlighted new work produced by graduating students, including the Senior Invitational Exhibition at Woods-Gerry Gallery, the RISD graduate thesis exhibition at the RI Convention Center, a selection of graduate student works at Sol Koffler Gallery and the Senior Film/Animation/Video Festival at the RISD Auditorium. A student-curated exhibition of undergraduate and graduate student work is also on view at the Gelman Student Exhibitions Gallery in the Chace Center.